Houttuynia cordata (simplified Chinese: 鱼腥草; traditional Chinese: 魚腥草; pinyin: yúxīng cǎo; literally: "fishy-smell herb"; Japanese: dokudami 蕺草, literally "poison blocking plant"; Vietnamese: giấp cá; Lao: pak kao tong ຜັກຄາວທອງ; Thai: phakkaawtong ผักคาวตอง, ผักคาวทอง, พลูคาว; Korean: 약모밀, 어성초. In Manipur, it is known as toningkok,, in Hmar as Aithang, in Meghalaya it is known as Jamyrdoh, in Mizo as Uithinthang, and in Paite as "Aithanglou". In English, it is known as fish mint, lizard tail, chameleon plant, heartleaf, fishwort, and bishop's weed. It is one of two species in the genus Houttuynia (the other being H. emeiensis), a flowering plant native to Japan, Korea, southern China, and Southeast Asia, where it grows in moist, shady places. Houttuynia cordata is a herbaceous perennial plant growing to 20–80 cm (7.9–31.5 in). The proximal part of the stem is trailing and produces adventitious roots, while the distal part of the stem grows vertically. The leaves are alternate, broadly heart-shaped, 4–9 cm (1.6–3.5 in) long and 3–8 cm (1.2–3.1 in) broad. Flowers, growing usually in summer, are greenish-yellow, borne on a terminal spike 2–3 cm (0.79–1.18 in) long with four to six large white basal bracts. The plant grows well in moist to wet soil and even slightly submerged in water in partial or full sun. Plants can become invasive in gardens and difficult to eradicate. Propagation is by division. In temperate gardens, it is usually found in one of its cultivated forms. The 'Chameleon' variety (synonymous with H.cordata 'Court Jester', 'Tricolour', and 'Variegata') is slightly less vigorous than the parent species, with stubbier leaves mottled in both yellow and red. Another common variety, 'Flore Pleno', has masses of white bracts and retains the vigour of the parent species. It is grown as a leaf vegetable, particularly in Vietnam, where it is called giấp cá or diếp cá, and is used as a fresh herbal garnish. The leaf has an unusual taste that is often described as 'fishy' (earning it the nickname "fish mint"), so it is not enjoyed as universally as basil, mint, or other more commonly used herbs. In northeastern India, particularly Meghalaya, it is locally known as ja myrdoh and used in salads or cooked with other vegetables. In Manipur, it is known as toningkok and used as garnish over eromba and singju, ethnic side dishes. In Garo, it is known as matcha duri, the leaves used raw as salad leaf, or ground (usually the tender roots) with dry fish, chillies and tamarind into chutneys. In Assam (Assamese) it is called "Masunduri" and popular mostly among the tribes. It is taken raw as salad and cooked along with fish as fish curry. 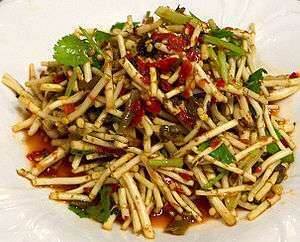 In the southwestern Chinese provinces of Yunnan, Guizhou, and Sichuan, the roots are used as a root vegetable and are known as Zhe'ergen (折耳根). The leaves are also consumed. 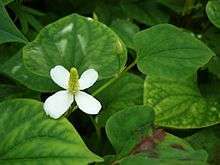 Houttuynia cordata is used in traditional Chinese medicine for pneumonia and was used by some Chinese scientists in an attempt to treat SARS. Its use in traditional Chinese medicine (in injection form) can cause severe allergic reactions. In Japan, the beverage dokudami cha (Japanese: ドクダミ茶; literally "Houttuynia cordata tea") is made from the dried leaves, widely used as a general detoxification for ridding the body of harmful bacteria. Chemical compounds that contribute to the aroma of H. cordata include β-myrcene and 2-undecanone. Heartleaf or lizardtail is an alien invasive species in many areas in the United States and Australia. Even the less vigorous forms will spread beyond an apt gardener's control if planted in any moderately moist soil. ↑ Wei W., Z. Youliang, C. Li, W. Yuming, Y. Zehong, and Y. Ruiwu. 2005. PCR-RFLP analysis of cpDNA and mtDNA in the genus Houttuynia in some areas of China. Hereditas 142: 24-32. ↑ Lu, Hongmei; Wu, Xianjin; Liang, Yizeng; Zhang, Jian; et al. (2006). "Variation in Chemical Composition and Antibacterial Activities of Essential Oils from Two Species of Houttuynia Thunb". Chemical & Pharmaceutical Bulletin. 54 (7): 936–940. doi:10.1248/cpb.54.936. PMID 16819207. Retrieved 31 March 2010. ↑ Ch, Muhammad Ishtiaq; Wen, YF; Cheng, Y; et al. (2007). "Gas Chromatographic/Mass Spectrometric Analysis of the Essential Oil of Houttuynia cordata Thunb by Using On-Column Methylation with Tetramethylammonium Acetate". Journal of AOAC International. 90 (1): 60–67. PMID 17373437. Retrieved 31 March 2010. ↑ Liang, Minmin; Qi, M; Zhang, C; Zhou, S; Fu, R; Huang, J; et al. (2005). "Gas chromatography–mass spectrometry analysis of volatile compounds from Houttuynia cordata Thunb after extraction by solid-phase microextraction, flash evaporation and steam distillation". Analytica Chimica Acta. 531 (1): 97–104. doi:10.1016/j.aca.2004.09.082. ↑ "JP 15" (PDF). 2006. Retrieved 31 March 2010. Wikimedia Commons has media related to Houttuynia cordata.